Gamefly Reviews - Best Way to Rent Video Games? Advertised as the nation’s leading video game rental service, Gamefly’s website and mobile app provide access to more than 9,000 games and movies that you can keep as long as you want and swap at any time, with no late fees, commitment, or risk. 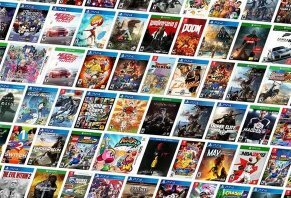 This includes renting and purchasing new release games and best sellers for popular systems like PS4, Xbox One, Nintendo Switch, Wii U, Wii, PS3, PS Vita, PS2, Xbox 360, and 3DS, as well as Bluray and DVD. If you don’t want to commit to purchasing an expensive console, you can even stream games directly to some smart TVs. It certainly seems like Gamefly’s service makes it easy to put video games in the hands of gamers. But does that necessarily mean they’re the only service out there, or that they’re the right one for you? These are just a couple of the core questions we’ll help you explore—starting with the basics. 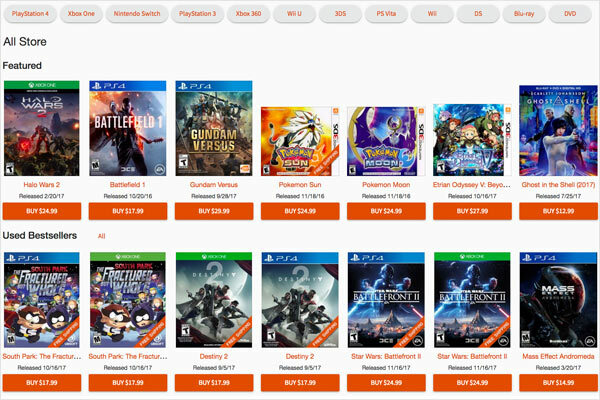 Whether you’re looking for games or movies to rent or buy, each part of the Gamefly is sectioned by date (new releases, coming soon) and bestsellers/most popular (including new and used), and is also searchable by keyword, platform, or format. Clicking on a title will take you to the main page, where you can read a short description, view media (images and videos), and read user ratings and reviews, details, and specs and requirements. Depending on your search terms or filters, Gamefly will list matching titles by name, release date, and price. Credit: Gamefly, Inc. Available Now - Game is in stock and should ship today. High Availability - There is a greater than 75% likelihood of shipping today. Medium Availability - There is a 50% to 74% likelihood of shipping today. Low Availability - There is a 25% to 49% likelihood of shipping today. Very Low Availability - There is less than a 25% likelihood of shipping today. According to the company, most titles with this status are rare or no longer manufactured. Regardless of the availability, you can add the DVD, Bluray, or game to your Gamefly Q (which is customizable at any time), where the company will “always try to ship you the highest-ranked, released title,” or the next available title in the order you specified. Pro tip: To ensure there’s always something available to ship, the company recommends always keeping at least 10 titles in your Q at all times. In addition to your list, the second part of your Gamefly Q is the ‘I Have Out’ section, where any titles currently in your possession will be listed. If you rent a game that you really enjoy, you can check your Q to see if the title has a KEEP button next to it. If so, you can purchase immediately and keep it forever, at which point they’ll send you the original case and any codes (when applicable). 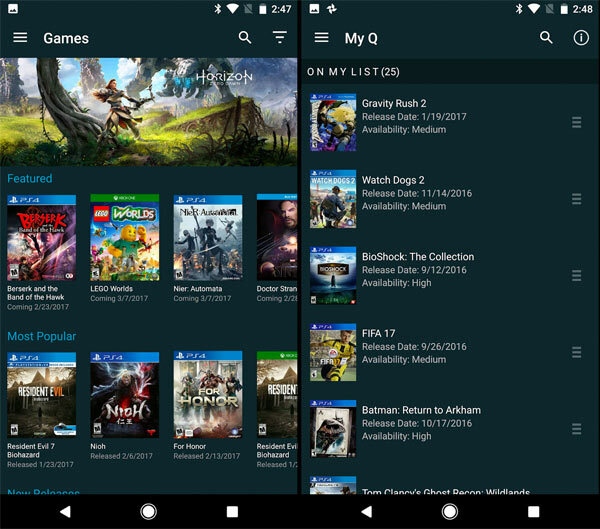 If you’re a Gamefly member, you can manage your Q through the website (as above), or through the app. Gamefly's iOS and Android app provide access to the same game and video library, searchable database, user reviews and ratings, gaming news, screenshots and videos, and Q functionality as their website, just in a mobile format. You’ll also have access to Gamefly’s cloud-based streaming service, which allows you to instantly access and play games through certain streaming media players and smart TVs, using nothing other than a broadband Internet connection and a compatible controller. In other words, without having to purchase an expensive console. Many of these games—including racing, adventure, shooters, family, action, and classics— even support local multiplayer (you’ll just need additional controllers for friends and family), and can be saved just like console-based options. Pro tip: Although you won’t need a console with their streaming service, Gamefly recommends a minimum download speed of 5 Mbps, with an ‘optimal’ recommendation of 10 Mbps. Regardless of which option you choose, all Gamefly memberships will automatically renew—regardless of whether or not you actively rent any games or movies—until you log into your account and suspend or cancel it. You can keep any game or movie for as low as you want, without having to worry about late fees or other penalties. As far as purchases, we found games priced as low as $7.99 and as high as $39.99 at the time of our research. All games and movies are sent via USPS from one of Gamefly’s shipping centers (Kansas City, MO, Los Angeles, CA, or Pittsburgh, PA) and should arrive within two to five business days. Once a title is shipped, you'll receive an email notification. Along these same lines, Gamefly’s unique FastReturn service (in partnership with the USPS) allows the company to improve delivery times by processing your next rental as soon as your existing title has been scanned. According to Gamefly's terms, all payments are non-refundable, and they do not provide pro-rated refunds if your cancellation is initiated during the middle of a billing cycle. Customer support can be reached at 888-986-6400, or via the contact form on the company’s website. What Can We Learn from Gamefly Customer Reviews? Gamefly seemed to come with mixed online customer reviews at the time of our research, largely depending on where we looked. For example, on sites like ConsumerAffairs, TrustPilot, and ResellerRatings, most customers appeared to rate the company somewhere toward the bottom of the spectrum; usually somewhere between one and two stars. Common complaints referenced service issues (non-functioning discs, long shipping times, checkout snafus, etc.). On the other hand, Gamefly had much higher overall customer ratings on sites like PCmag (although they emphasized limited availability continued to be a concern) and Rijalda.com (who also noted slow shipping times, as well as frequently damaged discs). Common compliments related to ease of use, the ability to try games before committing to a purchase, and competitive price (especially compared to taking your chances by purchasing an unplayed game). From a company perspective, GameFly, Inc.is part of the GamesRadar+ ad network, has been in business since 2002, and is based out of Los Angeles, CA. They held an A+ rating with the Better Business Bureau, based on 11 customer reviews and more than 40 closed complaints, as of 4/5/18. Again, service issues seemed to be a common complaint topic, although a representative responded in each instance with a resolution. Are There Other Video Game Rental Services Like Gamefly? Redbox $3 per night, $7 for 3 nights. Can also buy at the box for $9.99+ Can search and rent games online, but have to pick up at a physical location. Box-based DVD and Bluray. On-demand movies and TV shows. Let’s distill all of this data into actionable information as we wrap up. When choosing an online video game rental service, the ‘best’ option is largely going to come down to the specific features (i.e., pricing and other unique benefits) most important to you. For example, although Xbox Game Pass is the lowest priced monthly option in the table above, customers are also limited to just over 100 of that platform’s games. Also, no movies are available. Along these same lines, Redbox’s local pick-up might provide quick access to a title you’re interested in, and their per-night prices technically make them the lowest overall price. However, having to pick up at a physical location could be a pro or a con, depending on your point of view. Furthermore, if you rented one game per weekend, for three nights each time, you’d spend nearly $30 per month, making them potentially the most expensive route. As a final example, if you’re focused on gaining access to the most titles, Gamerang seems to take the prize. However, they don’t offer a streaming service (mail only), and they don’t have movies available. Bottom line: While they don’t offer the most titles, if you’re looking for an even mix of physical and streaming access to games and movies at an ultra-competitive price—including access to popular games without an expensive console, it might be difficult to go wrong with Gamefly (whether or not they’re actually the nation’s leading video game rental service, as advertised on their website). However, unless you intermittently game, rarely (if ever) play online campaigns, and/or always want to try games out before buying, Gamefly’s services might not represent a whole lot of financial value. After all, you’re already paying between $16 and $37 per month for a subscription, plus an additional $20 or $40 each time you chose to make a purchase. Comparatively, while you might not have the opportunity to try them in advance, it’s possible to purchase games at meaningfully lower prices through options like Best Buy’s Gamers Club ($30/yr membership fee; get 20 percent off all games) and Gamestop’s PowerUp Rewards Program (pay $15 per year and earn points with every purchase for future discounts). With these important caveats in mind, you can always take advantage of Gamefly’s free trial to test their service before making a financial commitment—just make sure to cancel in advance to avoid being billed for a recurring monthly subscription if you don’t want to continue. I will never use Gamefly again. I never got my games because they were lost in the mail, and they closed my account due to the Post Office losing the games. This is one of the most unprofessional businesses I have dealt with. People are better off using Redbox. Write a Review for Gamefly!